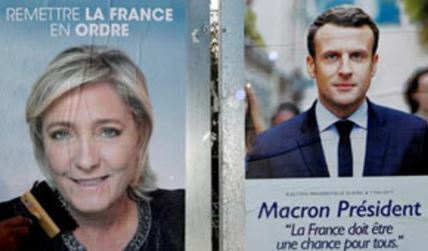 On Sunday, the organized Jewry and its controlled European Union (EU) leaders celebrated the victory of Emmanuel (a Jewish name) Macron as the new president of France by defeating his anti-Muslim opponent Marine Le Pen by 66:34 percent votes. Macron, a former Rothschild banker at 39 became the youngest French president in modern history. Now it appears French Jews voted for Macron to defeat Marine Le Pen, the daughter of Holocaust denier Jean-Marine Le Pen. Even though she fired her father and founder of Front National, got a Jewish boy friend and even prayed at French Holocaust Museum two weeks ago – Jewish vengeance was hard to die. After Marine’s success in the first round of elections, the Israeli mouthpiece, Le Monde, claimed that Front National vice-president for decades, Jean-Francois Jalkh, also denies the gas chambers story. Why? Because during his election campaign Macron said that if elected, he would continue Francois Hollande’s foreign polices, which include recognition of an independent Palestinian state, clash with French Jewish Lobby over Israel and trade partnership with Iran. On March 22, Macron while addressing 700 members and supporters of CRIF at a town hall meeting said: “My policy is to continue the current line of French diplomacy,” he also said: “I don’t believe French Muslims support terrorism.” His statement was against the organized Jewry expectation. Macron was forced to pause as result of hisses and booing from his audience. CRIF condemned France’s failed bid earlier this year to stage a Middle East peace conference in Paris without Israel’s support. Hollande said France was organizing the conference out of a commitment to peace and as a friend of Israel, but CRIF president Francis Kalifat clearly had his doubts. “Some pretend to be Israel’s friend, but there is no such thing as friendship: There are proofs of friendship,” Kalif said. Macron, as economy minister visited the Zionist entity in 2015. The Times of Israel reported on Monday that 96.3% of French Jews living in Israel voted for Macron. Last month, Russia’s chief rabbi Berel Lazar urged French Jews to leave France if Le Pen becomes president.